Tucked downstairs in one of the most ignored buildings on Bond Street (number 841, home to a small wine shop, an antique store and Rich Music), down an M.C. Escher maze of staircases under Townshend's Tea, is a new consignment shop, appropriately called "The Basement." Opened last week, the clothing store is more of a glorified hallway than some other shiny upscale boutiques downtown, but the new underground specialty shop has a diverse collection of vintage and used clothing. Owner Rachel O'Malley has lined the walls with chalkboards filled with art by local designers and racks of artsy clothing displays, a collection of one-of-a-kind pieces. "I love clothes," explained O'Malley. "Not only clothes. Look at this squirrel." She points to a lamp, a ceramic squirrel holding a round light bulb as big as his torso on top of one of the clothing racks, one of many quirky decorations that she has collected for the shop. "I basically have just been collecting things I'm attracted to. To me, it's very valley, Eugene through Portland. It's bohemian, a collection of lots of things." Apparel in The Basement varies from lush fur coats matched with locally designed jewelry to old-school to wool fedoras and shiny-buttoned western shirts with detailed embroidery, all of the best parts of your Grandparent's wardrobes and all things that O'Malley hopes will inspire confidence in their wearer. "When you're going on a date, the most common thing we say is, 'what should I wear? What's going to make me feel confident?'" reminds O'Malley. "I wanted to be able to provide things for people that they might not have noticed or seen." O'Malley has been collecting pieces from thrift stores and vintage shops since before Macklemore's "Thrift Shop" first blared across radio waves in 2012. Try closer to when Kurt Cobain's cardigans were sparking recycled fashion choices in the early-'90s. Now, at a time when being a hipster has lost its otherness, consignment is enjoying a healthy resurgence and is still one of the best ways to stand out from the crowd and save cartloads of cash. The business is also recession-proof, but O'Malley doesn't seem to care much about raking in the cash (almost everything in the shop is priced under $30), she is more focused on making her space one where community and individuality are valued. She's doing this by hosting mini-concerts on Fridays and inviting all types of consigners and artists to help create The Basement's one-off atmosphere. Downtown has other vintage options. Rescue Consignment sells both vintage and lightly used items, along with one of the best selections of local designers of apparel and jewelry around. The literally underground Frugal Boutique, below Silverardo and next to Bend Alterations is stocked with antique one-of-a-kinds for cheap. 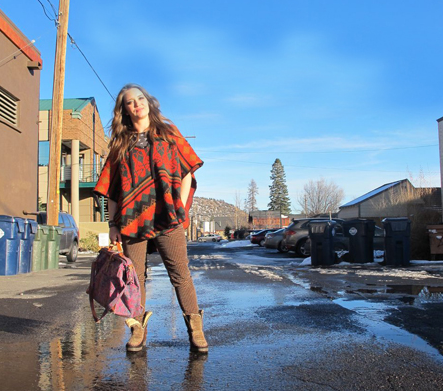 O'Malley said she has been inspired by Cowgirl Cash, another downtown Western-specific vintage boutique that specializes in boots, and by the collaborative artists space, The Workhouse, that sells local designs, some that are repurposed from vintage fashions. Making use of these carefully curated stores can add character to the standard t-shirt and jeans many of us find ourselves stuck in daily— see the patterned carpetbag and poncho that local designer Sarah Viles (who designs under the moniker, Homeslice) picked up at The Basement last week. The 2013 winter fashion predictions from Vogue are touting markedly vintage looks as freshest winter trends, ones that The Basement is full of. Circle skirts, feather embellishment and oversized pedal patterns take the spotlight, along with distinctly-mod looking stripes and checkers; all things that are more likely found at one of Bend's consignment shops than on a rack at Macy's. For men, these stores are stocked with Pendleton shirts with shiny snap buttons, the quality and individuality of which beat the heck out of any mall rack flannel. Adding vintage pieces to the closet, ones that are preapproved by the curators of these consignment collections, can add stylish, quality and functioning zest to any outfit. Bend may not be akin to the couture runways of Europe, but it's also not the Goblin tunnels of middle earth. Our town has a winter backcountry style abundant with North Face fleeces and Sorel boots, and by adding some vintage puff pieces, it's easy to stand out from the "mountain fancy" crowd.